Use room temperature water to rinse out the pen cap. 2. Take apart the pen and rinse the feed under running tap water. Make sure the water is room temperature. (Not a bad idea to put some kind of strainer over the drain to keep the fountain pen feed out of your garbage disposal if you drop it.) I personally like to soak the feed in a glass of water overnight if I remember and have the time. Screw the pen back together. You can skip step number 2 entirely if you wish. Rinse out the feed under a running tap. Use room temperature water. 3. Turn the fountain pen piston knob counter-clockwise until the piston mechanism is all the way at the bottom (nearest the nib). 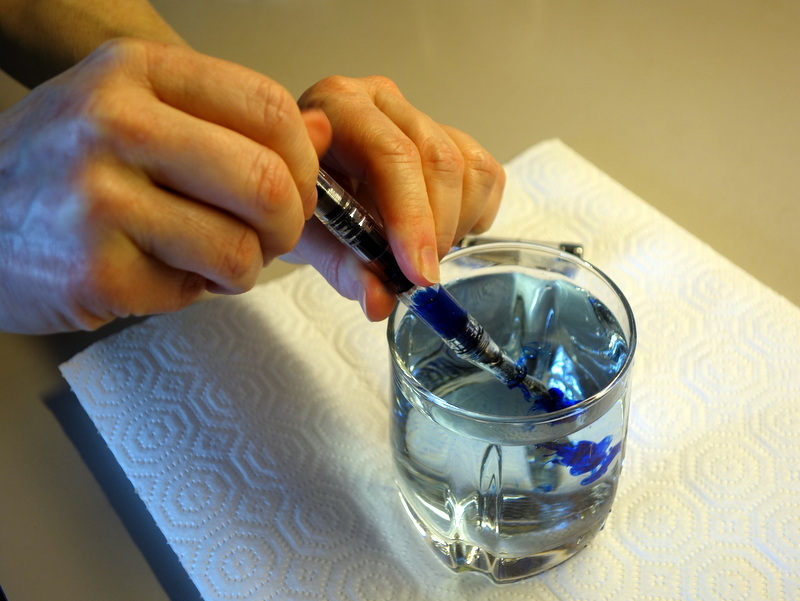 Submerse the nib in a glass of clean room temperature water. Twist the piston clockwise (as far up as it will go) to draw water into the pen. 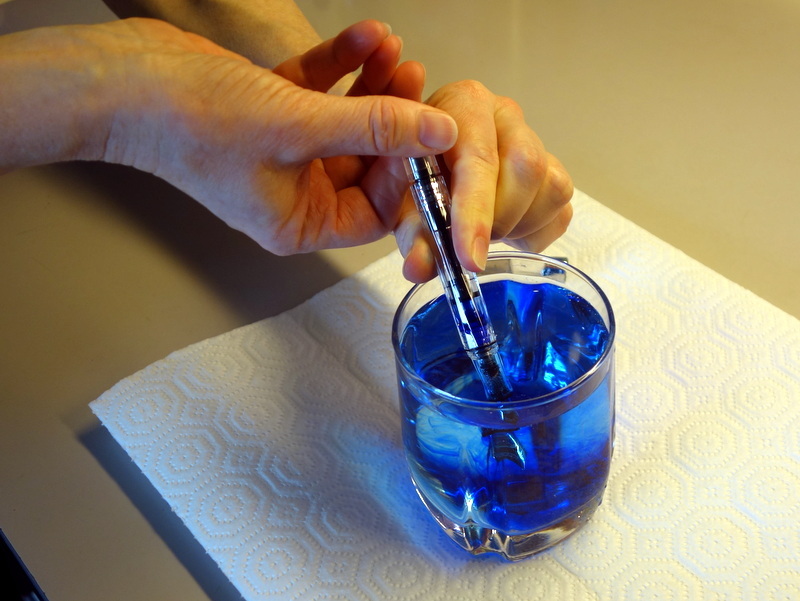 Submerse the nib in a glass of water. Twist the piston to draw water into the pen. The ink remaining in the pen will mix with the water. 4. Turn the piston counter-clockwise to expel the water from the pen. Repeat step 3 and step 4 over and over again until the water from the pen runs clean and clear. You will need to dump the inky water out of the glass and refill it with clean water a few times. Keep refilling & expelling water from the pen repeatedly until the water runs clear. Change the water in the glass a couple of times as you continue. Eventually the water inside the pen will be clear & clean. In this picture you can see a bit of blue ink stain inside my pen. I could use a fountain pen cleaning solution to work on removing this. Blot the nib on a paper towel to see if there is any ink remaining in the feed. 5. Once the water coming from the pen is clear, twist the piston counter-clockwise to expel any water remaining in the pen. You can test to see if there is any ink left in the feed by blotting the nib on a paper towel. If the paper towel remains clean you’ve done a thorough job. For best results let the fountain pen dry out on a paper towel overnight before you refill it with ink. What’s your favorite method for cleaning a piston-fill fountain pen? What should you do when you want to change the ink color in your fountain pen? 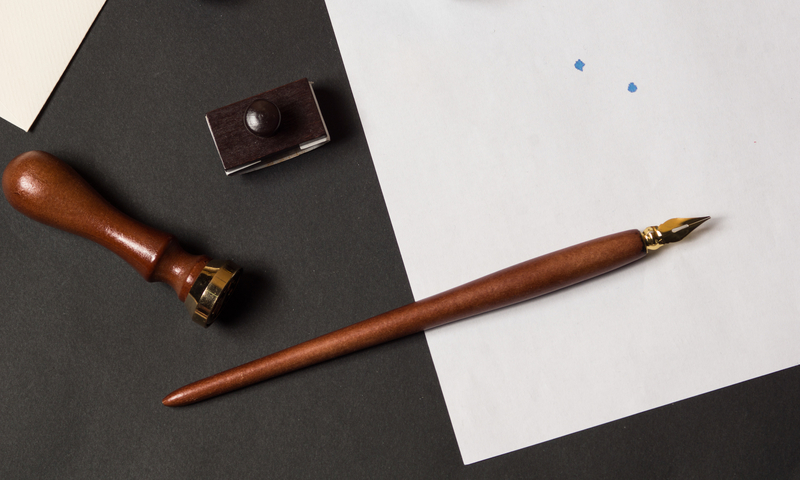 The ability to use a variety of brands of ink in a wide range of colors is one of the reasons writing with a fountain pen is appealing. What should you do when you want to change the ink color in your fountain pen? There is more than one answer to this question. The safest thing to do when you want to change to a new ink color is to wash out the fountain pen and converter (if you’re using one), let the pen dry overnight, and then refill the pen with new ink. Usually room temperature water is all you need to wash a fountain pen, but if you’re having a hard time getting rid of dried up ink you can try a cleaning solution such as a DIY fountain pen cleaning solution. Sometimes I like to watch one color of ink slowly transition to another color. This can be especially fun when you have an appealing color combination such as pink to orange, brown to amber, blue to green or black to blue. This is easily done with a cartridge filled pen – just pop off the empty cartridge and attach the new one. 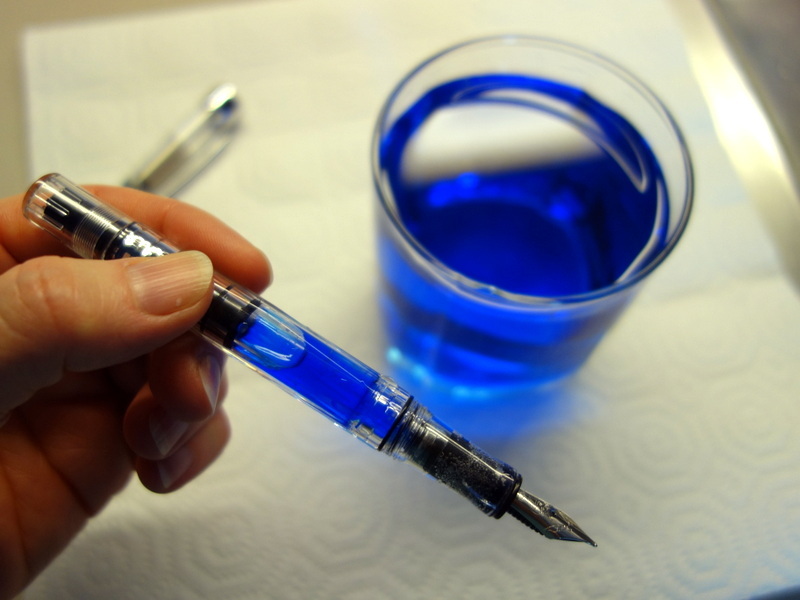 If you’re using a fountain pen with an ink converter this is also possible, however, we would recommend removing the converter from the pen and refilling it with a blunt tip needle bottle or syringe to prevent contaminating the ink in the bottle of the new color with the previous color of ink. A note of caution: not all fountain pen inks are compatible when mixed together. Avoid mixing pigment based inks, blue-black inks, Noodler’s Baystate or Golden Pig inks. For more details read our previous blog post: Fountain Pen Ink Mixing – Combinations to Avoid. What procedure do you like to follow when you change ink colors in your fountain pen? The Monteverde Mini Converter is a handy little tool to have around when you want to flush out a fountain pen with water to clean it. The supplies you will need are: a glass of cool or room temperature water, a fountain pen or rollerball pen that uses standard international ink cartridge refills (the Mini Converter is compatible with most of these type of pens) and the Monteverde Mini Ink Converter. Attach the Mini Converter to the feed of the pen and push the black plunger down. Immerse the nib or tip of the pen in the water and pull the black plunger on the Mini Converter up to draw water into the converter. Push the black plunger down to expel the water back into the glass. Repeat the above step several times, drawing water into and then pushing it out of the converter. Replace the water with clean water as many times as it takes for the water to remain clear as you draw water in and out of the converter. When the water is all clear you’re done with the cleaning. Push the black plunger on the Mini Converter down to expel the water. Remove the converter from the pen and dry off the pen feed and nib with a soft cloth. Let the pen dry overnight if you wish. Attach a new ink cartridge to the feed of the pen, wait awhile for the ink to seep into the feed and you’re ready to write – easy! One easy way to keep your fountain pen working smoothly is to give it a simple cleaning about once a month. 1) Take off the cap and unscrew the barrel of the fountain pen. 2) Remove the ink cartridge. If it still has ink in it, remember to put the cartridge somewhere safe. Perhaps open side up inside a shot glass? 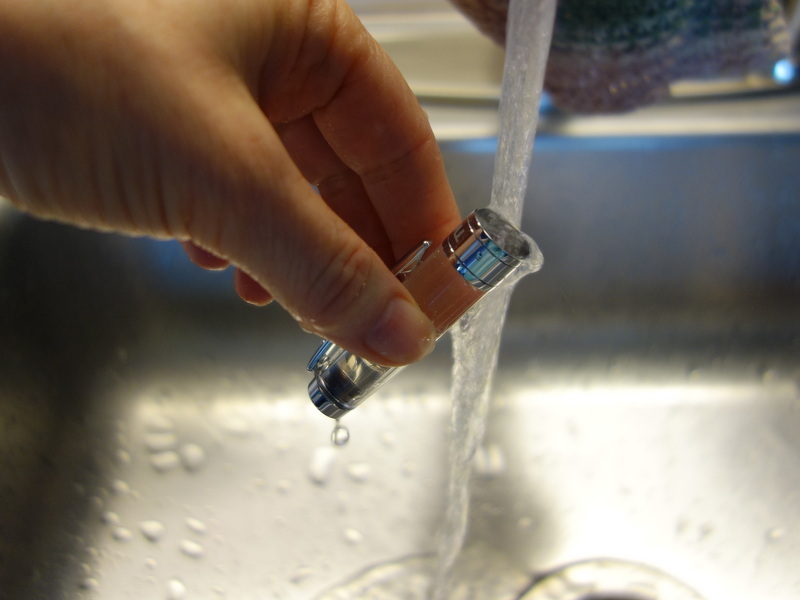 3) Hold the feed and nib section of the fountain pen with the nib pointing down under cool running tap water. Continue to do this several seconds until the water runs clear. 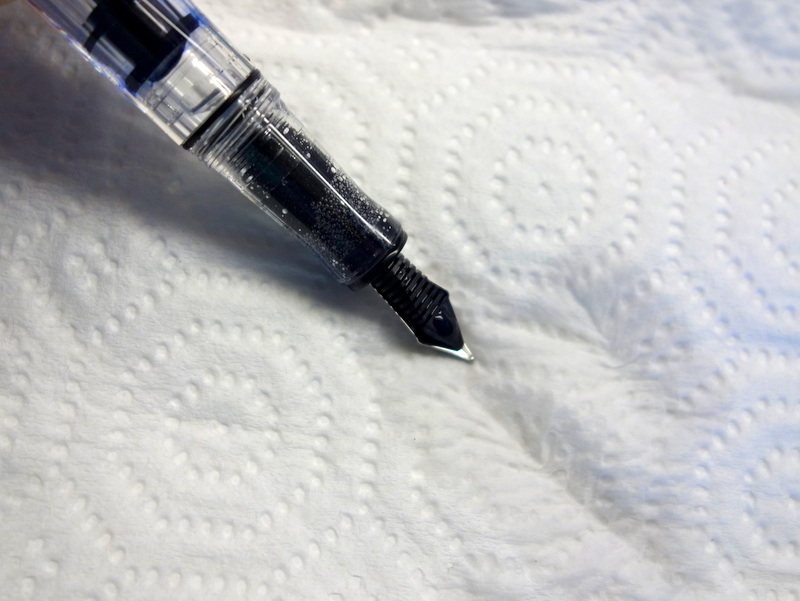 4) Use a paper towel to blot the water off the fountain pen nib and feed. It’s okay if ink is still inside the feed and comes out of the nib onto the paper towel. 5) Insert the ink cartridge into the pen, screw the fountain pen back together and put the cap back on. That’s it – you’re done! Simple and effective for most situations. For a more thorough cleaning, you can try this fountain pen cleaning solution. 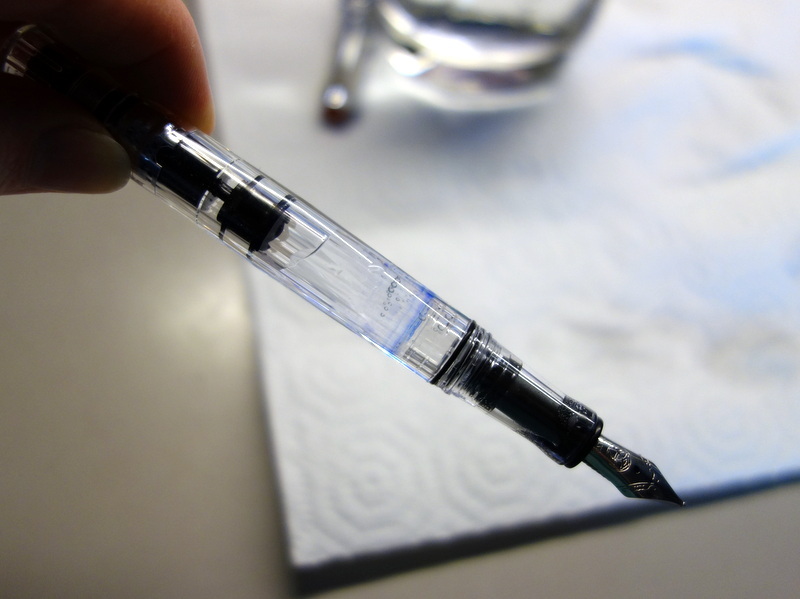 Most of the time, room temperature water is sufficient for cleaning a fountain pen. However, if your pen has a lot of dried ink in it or you want to change your ink color or ink brand, a good soaking in a cleaning solution can help. This recipe was created by an experienced fountain pen user. A word of caution: we do not recommend using this formula with old or vintage fountain pens because ammonia or even water can cause damage to them. This solution should be safe for most modern fountain pens, but again, please use caution if your pen is made from some specialty material. Store the solution in a wide-mouthed glass jar large enough to immerse the parts of a pen. Take apart your fountain pen and soak the feed and nib in the cleaning solution for several hours. Most of the time it is not necessary to soak the barrel or the cap. Remove the feed and nib from the cleaning solution and rinse with room temperature tap water until water runs clear. Blot with a clean, lint-free cloth and allow to dry overnight. This solution can be used several times. It is a bit smelly! Follow all warnings on the household ammonia container and do not mix with chlorine bleach. Others have had success soaking & cleaning fountain pen feeds and nibs in household ammonia straight from the bottle. 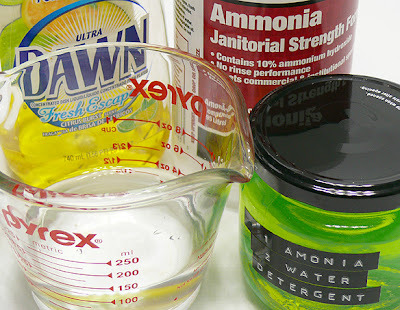 They warn that before doing this be sure that the household ammonia has no more than 10% ammonia in the solution! A stronger solution may damage your pens.